Violinist and vocalist Irene Sazer founded the group seven years ago. An original member of the famed Turtle Island String Quartet, she wanted to combine her musical passions – chamber music, improvising, composing, and singing. She found ideal collaborators in Alisa Rose on violin and vocals, Dina Maccabee on viola and vocals, and Jessica Ivry on cello and vocals. 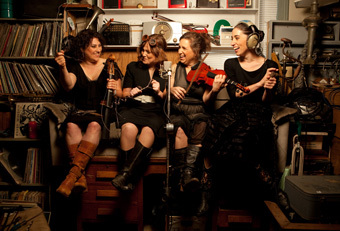 The Real Vocal String Quartet brings together a world of music and a wealth of musical possibilities. The Bay Area’s True Life Trio weaves sumptuous vocal harmonies and sultry rhythms from far-flung lands like Macedonia, Albania, South Africa, and Louisiana to create a glorious musical patchwork of tradition and improvisation, classic folk tunes and bold originals. 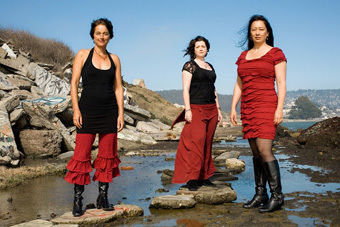 With Leslie Bonnett on fiddle, percussion, and vocals, Briget Boyle on guitar, percussion, and vocals, and Juliana Graffagna on bass, percussion, and vocals, the trio continues a musical collaboration that began when they were members of Kitka Women’s Vocal Ensemble. They’ve just released their first album, Home, a collection of songs inspired by the rich traditions of Eastern Europe and the Americas.